Identity theft is one of the fastest growing types of crime. Millions fall victim each year, and in the age of the Internet, it’s becoming more of an issue. The good news is that protecting yourself from identity theft isn’t difficult or complex. All it requires is a few common sense precautions. But first, one thing you have to understand. The way most online hacking happens is actually rather low-tech. Someone calls a customer service line with some fragment of your personal information. It might be your street address, old passwords, or user name. Using those bits of information, the caller then tricks a customer service agent into revealing more information about you. And that’s all it takes. Little bits of seemingly harmless information can be extremely dangerous in the wrong hands. What are your options? One solution is using a pen. We’ve all tried scribbling over documents with pens before. And we all know it works… if you’ve got the right pen, and you’re willing to stand there and scribble until your wrist aches. Choosing a great identity theft protection roller stamp is largely about knowing how to avoid getting a useless knockoff, and how to avoid getting nickel-and-dimed with refills. But you also need to know what types of documents you’ll wanting to stamp across, especially if they’re non-traditional media or glossy media. And you’re going to want to think how long you need to use the roller stamp, and how many rolls you’ll be able to get from one stamp. Your first and foremost concern is whether or not the stamp can actually protect your stuff, which is largely a matter of having the right ink. Cheap water-based inks will generally get the job done, but they also bleed through your documents. And they may be susceptible to removal under some circumstances. However, they’re a good choice for people who are looking for something cheap and simple. Oil based inks don’t have the same type of bleeding problems. They tend to be marginally more expensive with respect to refills, but provide the widest depth of protection for the information underneath. They’re essentially impossible to remove from your documents. How long can the stamp roll before it runs out of ink? For any of the best identity theft protection roller stamps, you should expect at least 100-feet of stamp for any purchase. That’s enough to take on hundreds or thousands of documents, depending on the size of the area that you want to protect from identity theft. If you’re trying to roll over a 1.3-inch block of address text, then you don’t want to be using a 1.5-inch identity theft protection roller stamp. The seemingly small difference is actually wasteful of ink, and that waste can cumulate rapidly. Likewise, if you’re trying to roll over 2-inches of text, you don’t want to be using a 1-inch roller. But that’s simply about making effective use of your time. Often times, identity theft protection roller stamps are constructed with fixed sizing. That being the case, you’ll want to think about the most effective size of the stamp for your own documents. Alternatively, some identity theft protection roller stamps provide the ability to make small adjustments to the sizing roller. Adjustable rollers are generally a more convenient option, though fixed-size rollers have their own merits, as we’ll see in a moment. If you’re only using a roller stamp for a short interval, like for blotting out a single piece of junk mail, then comfort isn’t going to matter much. All you really need to know is that your hands aren’t going to get covered in ink. 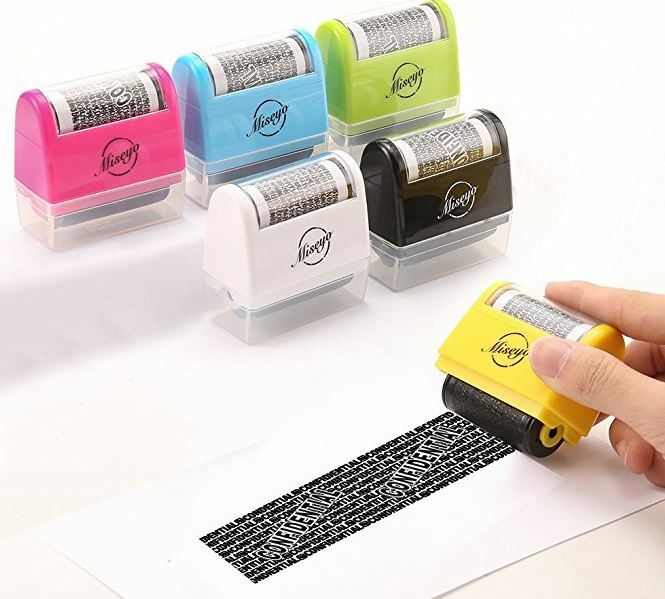 But if you’re sitting down at the end of the year to sort out all your documents in one pass, then you’ll have the roller stamp in your hands for more than a few minutes at a time. And that’s when you start thinking about comfort. For someone doing higher volumes of throughput, you want to look for elements like grip strength, and handle length. Sometimes the smallest roller isn’t your best option. Being compact is good, but being truly hand-held is better. If you’re going to use an identity theft protection roller stamp for years to come, then you’re probably going to want something that’s refillable. And if you’re involved with higher volumes of document protection, you’re going to almost certainly want a refillable ID protection roller stamp. As with a printer, this means thinking about replacement inks. Fortunately, identity theft protection roller stamp ink is far less expensive than printer ink. Typical replacements may only cost three or four dollars, but you’ll nevertheless want to look at ink pricing specifically for any refillable roller selection. Disposable roller stamps are a good choice for someone doing low-volume stamping, or someone involved in a single small project. They’re usually the least expensive option available. And more often than not, they’re constructed to use temperamental inks that are adept at dealing with glossy documents. Many people favor Japanese office equipment. The Miseyo Wide Roller Stamp can give you a clue as to why. A fairly strong alternative to shredders, this stamp provides an adjustable length for wide identity protection coverage. When brought to its full length, 1.5” roller can easily cover a block of addresses in in one single pass. It’s made to obscure the text, and it does quite well. 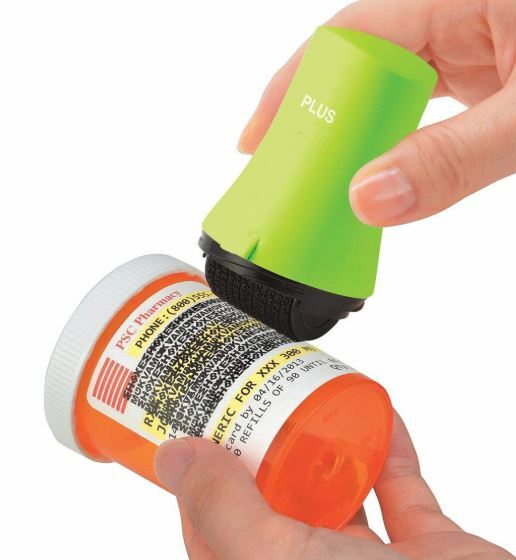 The Miseyo roller stamp is quite handheld and portable, measuring 2.4 x 1.2 x 2.4-inches. On the bottom side of the roller, there’s a hole which can be refilled with ink. Miseyo refills are actually as simple as popping open this hatch and dropping a fresh ink container inside, you don’t even need a special tool to get started. Aesthetically, Miseyo’s roller is available in blue, pink, green, white, and black. As you remove the plastic cap roll it across a document, the stamp prints out a repetitious pattern of angled lettering. Over that, the stamp reads “CONFIDENTAL.” And one thing worth noting about the Miseyo Wide Roller Stamp is how the ink dries quite quickly. That allows you to move from one document to the next without having to worry about each becoming dry before moving on. The Miseyo Wide Roller Stamp can cover nearly 300-feet of stamping before it needs a refill. 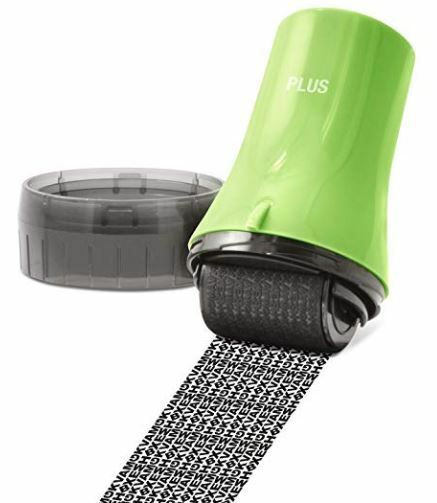 The upgraded version of this roller actually includes three refills, which ends up being a fairly high value for anyone planning on doing large quantities of stamping in one sitting. With respect to the media you stamp on, the Miseyo Wide Roller has no problem rolling over regular paper, package address, and envelopes. But when you’re done rolling it, you’ll need to reattach the large plastic cap to protect the ink rollers from drying out. The Vantamo Identity Theft Protection Roller Stamp is more than a simple identity protection stamp. It’s somewhat closer to being an identity protection kit. Notably, this kit includes three complete refills, as well as an e-book on privacy protection. Those extras only add value to an already highly adjustable roller, which makes it possible to conserve ink over extended use. As with Miseyo’s stamp, Vantamo’s roller stamp is quite compact and handheld, measuring 2.5 x 1.5 x 2.5-inches and weighing about two ounces. But what really makes this stamp stand out is how cost effective it is over time. Ink refills are roughly one dollar each, which is fairly inexpensive not only relative to competitors, but also in consideration of how each roller lasts. Unlike Miseyo, aesthetic options are somewhat thin, with your selection forced between white or black. 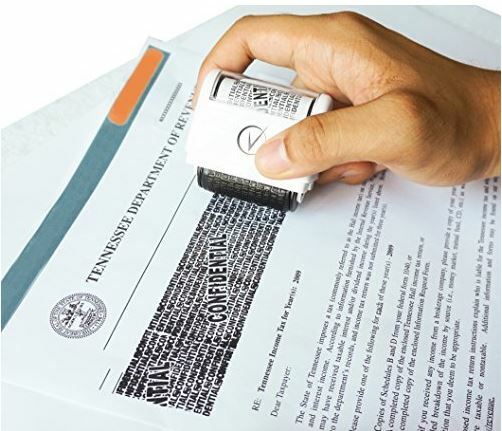 Rolling it across your documents, the Vantamo Identity Theft Protection Roller Stamp is fully effective on plain paper. But it will not perform on glossy surfaces. That’s because the Vantamo roller uses oil-based inks, which can take as long as five minutes to dry. Once dried, the blackout weave of block covers everything beneath. 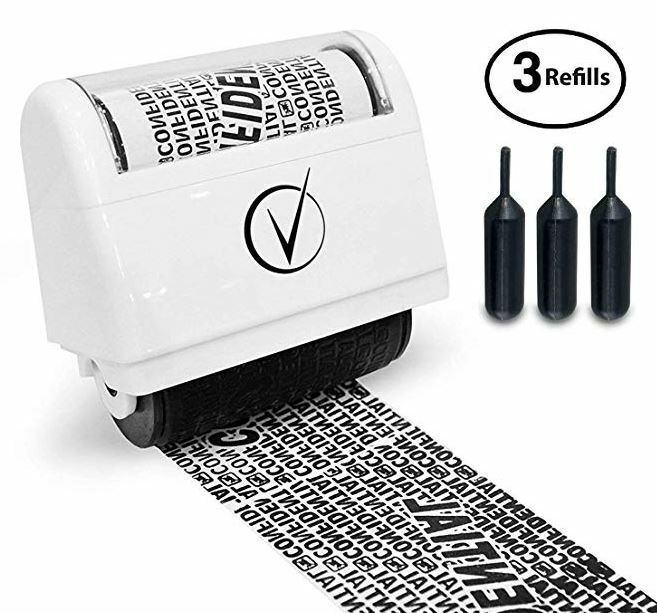 The easy to use instructions are actually fairly useful for getting acclimated to using the Vantamo Identity Theft Protection Roller Stamp. The e-book isn’t terribly insightful, but it does provide information about the fundamentals of identity theft protection. If you don’t know the first thing about defending your identity, then you’ll certainly find some useful information. And Vantamo includes a 100% satisfaction guarantee, backed by the promise of a refund. Protecting your identity should be simple. But it’s also something that you’ve got to keep doing, year in and year out. That’s why it’s worth checking out the Guard Your ID ADVANCED WIDE Roller Security Stamp, which has clearly been made to last. Moreover, using it is as simple as any roller stamp should be. Just pop open the cover, roll the stamp pattern across your documents, and watch up to 6-lines of text instantly disappear. 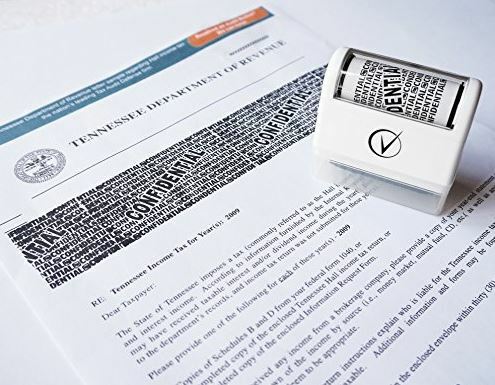 As with any of the best identity theft protection roller stamps, the ADVANCED WIDE Roller Identity Theft Security Stamp is handheld, portable, and easy to store away. It’s actually somewhat on the smaller side even among other stamps, measuring 1.8 x 1.8 x 3.2-inches, and weighing just over one ounce. Each roller is built to provide 160 feet of effective inking. 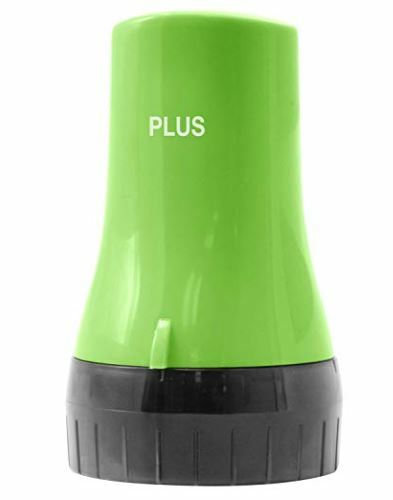 The slightly lengthy design allows for a smoother rolling action and a generally more comfortable grip, though if you hold it too close to the base your fingers are at risk of contact with ink. Aesthetically, the Guard Your ID ADVANCED WIDE Roller Security Stamp is available in green, blue, pink, white, and office black. This stamp uses an ink specifically made to adhere to glossy surfaces. It’s perfectly adequate for ordinary paper media, like standard legal paper, but it’s uniquely suited for junk mail, pill bottle labels, and so forth. The ink pattern uses black text that’s been angled and patterned in such a way as to totally obscure what’s beneath, even small print is covered and made inscrutable. But as is the case with nearly all glossy-ink protection roller stamps, this roller does not provide refill options at all. The Guard Your ID ADVANCED WIDE Roller Security Stamp is a good choice for someone who’s concerned about cleaning up documents with glossy surfaces. It’s not refillable, but each roller is expensive enough that they’re not a burden to replace. If you’re trying to protect your identity on non-traditional media, it’s your best choice. The Vantamo Identity Theft Protection Roller Stamp is an excellent choice for someone on the hunt for value. The inclusion of three refill packs prepares you for protecting hundreds or thousands of documents. While these stamps have virtually no application for glossy surfaces, they’re highly effective when used on the surfaces for which they were intended. Lastly, the Miseyo Wide Roller Stamp is the right instrument for long-term use. It’s refillable, although it does not come with a large cache of extra ink. 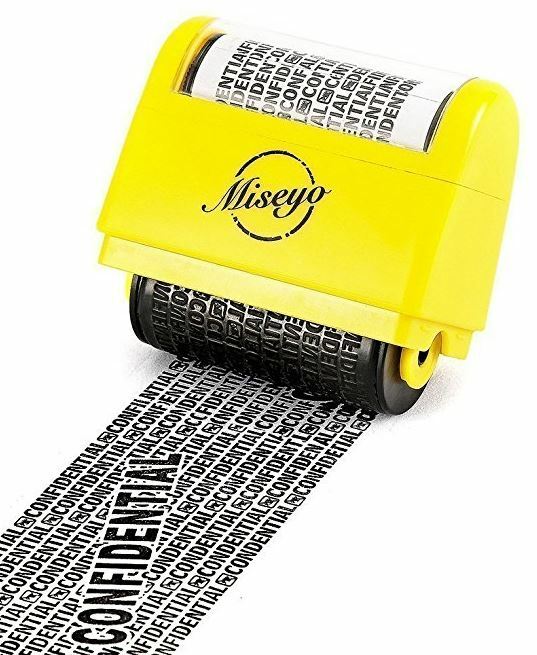 Whether you’re primarily concerned about junk mail, or you’re working in the office, the Miseyo Wide Roller Stamp is a well-rounded option appropriate for almost all circumstances.